Drew, now 12, whipping up some cheesy goodness as an 8 year old. I have the blessing of being married to a very helpful husband who is an excellent cook in the kitchen, does the bulk of our grocery shopping, and does dishes too. I don't ever want to take him for granted. role model in the person of his father. Time and time again, I hear of men who are hands off around the house, namely in the kitchen. And I can't help but wonder what kind of role model they had in their father? I see the amazing difference a helpful mate makes in my life, and I want the same for my boys' future wives. As parents of three boys (along with four girls), we see the importance of raising our boys to be helpers that are confident in the kitchen. So when they leave this nest, they will be self-sufficient men who will be able to sustain themselves on more than the nutritionally deficient ramen noodles and boxed meals that I ate in my nest-flying days. Also, that they will be able to bless their future families the way their own father has ours. So if you'd like to get your boys involved in all things kitchen related, this is your day! 2. Show your boys where the groceries go in the pantry and refrigerator and have them help you put them away. Our boys help bring groceries in from the car and are responsible for stocking the pantry on Costco shopping days. What better way to get them comfortable in the kitchen if they are responsible for putting things away in it and can tell you where everything is found? 3. Teach your boys how to unload the dishwasher when you feel they're ready to do so (around age 6-8), then as they age and are good at that job, teach them to load it too. The boys (ages 10 and 12) are great dish helpers. We taught them to unload the dishwasher as a team a couple years ago and they happily chit chat the time away as they empty their designated dishes and put them away. Each day, they are responsible for unloading the dishwasher together as a morning chore, and they do the complete dinner clean-up as well. That includes clearing the table, sweeping, wiping down the counter and table, doing the dinner dishes, and scrubbing the hand washables and setting them to dry. Let them chose some music to listen to, it's a big job! This has hands-down been the biggest help around the house for me, since much of my time is taken nursing the baby and wrangling the little ones. It has taken quite a load off, especially since we welcomed Gabi, Levi, and Emmalie these past two years. 4. Let them see their Dad at his culinary best! Even if your man only steps foot near the food to do the grilling, let them help and learn how. Jeremy is very comfortable in the kitchen and that has come with practice. He has tried his hand at and has gotten really good at grinding his own wheat and making bread, cooking, grilling, canning, and experimenting with his own recipes. Talk to your husband about what you want your sons to learn as they grow up in your home, then let Dad be the example you'd like for them to model after. 5. Teach them to have servant's hearts. One thing I think makes a huge difference in a healthy family life, is teaching all members of the family to have servant's hearts toward each other. If you're walking into your home with an attitude to be served, rather than to serve others - you're walking to a trap of disappointment you've set for yourself. Our kids are learning that extending oneself for the sake of others as Christ did for us, is more rewarding than any amount of service that was brought to them by another. Engaging in acts of service directed toward each other is a visible way that we can serve God first and foremost with our actions. "But not so with you. Rather, let the greatest among you become as the youngest, and the leader as one who serves. For who is the greater, one who reclines at table or one who serves? Is it not the one who reclines at table? But I am among you as the one who serves." 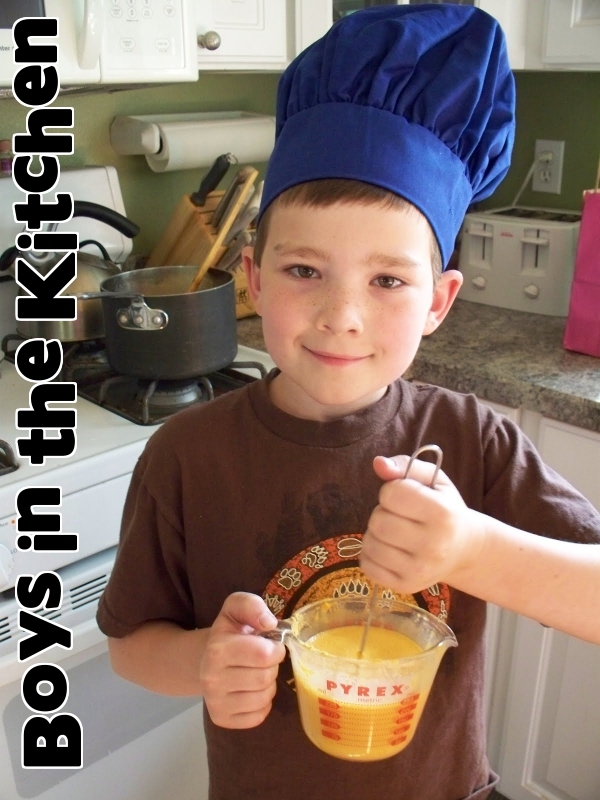 2 comments on "Boys in the Kitchen - Top 5 Ways to Get Them Involved While They're Still at Home"